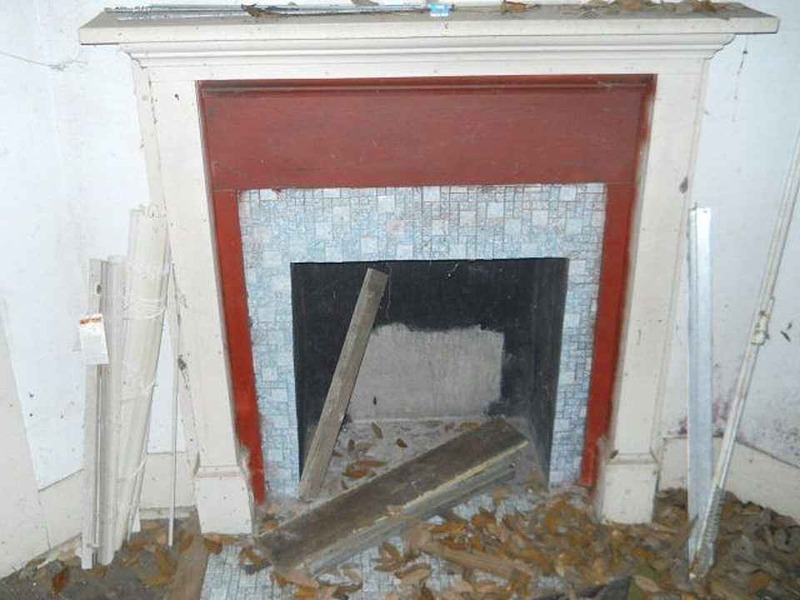 Large Victorian home in need of restorations is waiting for the right investor. Whoa those vines! Love the porch detail. Swoon! Agree! 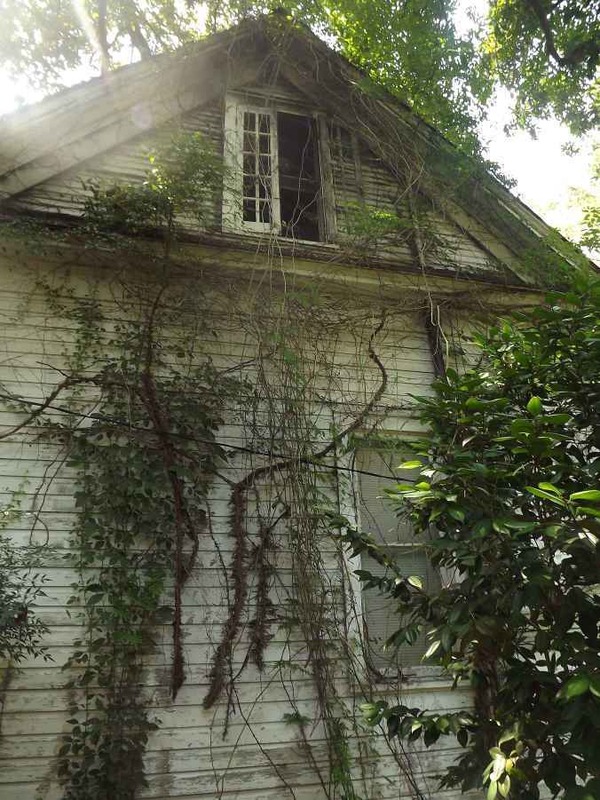 For $28,000, the gorgeous exterior alone makes this one worth saving. The house is not overpriced but definitely underloved. 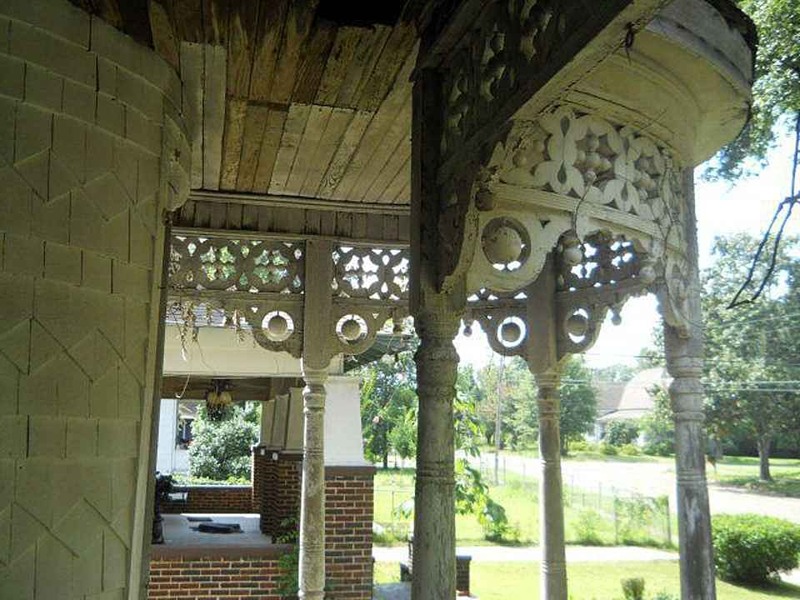 The Porch is still at a point that its restorable and duplication of the column can be done. I suspect water damage but I wouldn’t rule out termites. The patterned saws shingle work on this house is incredible and I can imagine this painted out in an appropriate color combo. This would be a perfect painted lady book house post restore. Get the paneling out and assess the condition of the plaster. Pocket doors are nice as are the mantels but someone who knows what they are doing needs to faux marble them. The faux graining is too regular and you can tell, so start over. What is the hole in the floor inside? A heat register with cover removed? I think the hole is less a large register and more a furnace underneath with the grating missing. When I was younger, my mother did something similar to the hallway in our small house. During the winters we would huddle over the grating to dress as the warm air shot up from underneath. My cat does the same thing. It reminds me of a Pink Panther episode. The Pink Panther would just put a rug on it, even if it means the mother will fall into the hole. What an excellent exterior. I love that porch. I have to wonder about a house as cheap and beautiful as this, apparently vacant for years. Worth saving? Not a question so easily answered if it’s your money. Very impressive exterior details (albeit neglected) although the interior is more modest-at least in its current configuration. It may have been just as ornate originally inside. Not well cared for as Paul has noted. A creative carpenter took various scroll-sawn and turned ornamental elements and combined them to make this gingerbread confection. One seldom sees these highly ornamental houses nowadays but they were once very common. (I can recall many years ago gazing in awe at blocks of these fancy houses now almost all gone or have been altered with artificial siding and the ornamental details removed and discarded) Even in its neglected condition, one can see the potential in this house but the location and required work to bring it back are not for the faint of heart. I noticed in streetview a number of older homes in the neighborhood and I did not notice any that were restored. I grew up in this house back in the ’60s, when it was in proper shape. My friends called it, ‘the castle’. Part of the house burned in the 80’s, and the back rooms still show the damage. It has not been properly repaired since the fire. The pictures show only the front rooms. There are / were three rooms upstairs, along with a bath. The hole by the pocket doors between the living room and dining room is definitely an old floor furnace. The neighborhood is starting to undergo a bit of revitalization, albeit very slowly. The houses on both sides are in good shape, but a couple of the houses across the street are falling down. For someone who could put their heart and wallet into it, it could be a true Victorian showpiece, from the very early beginnings of McComb’s history. Hi Linford, I am in the process of purchasing this house and am interested in it’s history. I assume you are related to Henry & Hank, am I correct? Also I would love to get a digital copy of the photos you posted here if possible. I downloaded these but they were not the best quality. I appreciate any info you can provide. Good Luck on restoring this, I would love to be able to watch your progress, are you on Facebook? Congratulations on your purchase! I am an old house owner and lover. I live in a ca.1900 Victorian in New Jersey. My questions are: What kind of floors in the house? My house has pine floors throughout most of the house. The kitchen and bathrooms had linoleum floors. All the walls and ceilings in the house were wallpapered. Where I could see remnants of original papers they were ornate. The roof was black slate with built-in gutters at the edge. It was reslated with Peach Bottom slates. The roof had holes that previous roofers covered with aluminum and then shingles. There was a branch circuit that went up the side of the house, over the overhang and right through a hole in the sheet metal! Thankfully the slate roofers repaired the roof deck and when they did they were amazed that the roof was straight and did not dip or settle in any way. I see the woodwork in the house is painted. I hope you will strip it. Do you know what the species is? My house has chestnut, which is very similar to oak in appearance. I am sending you my prayers that the Lord blesses your house and your efforts! So glad to hear someone bought it, have been watching it for years. We lived in a restored 1910. What a sweet looking house – the molding and exterior details make me drool! 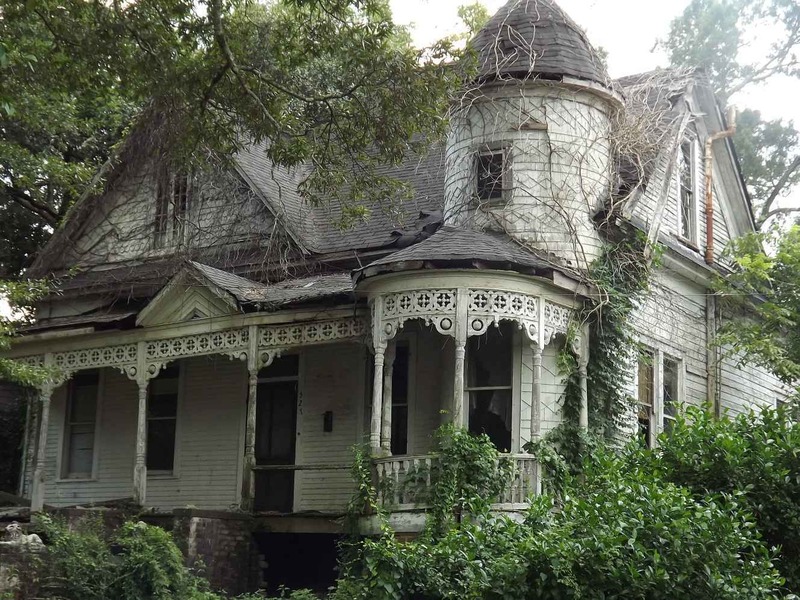 These fixer uppers are my favorite to look at. I see so much potential in them. Wow… So beautiful! The inside is definitely modest, but has some great bones that I’m sure could be something pretty impressive. That exterior though… I wonder how bad the structure is as this point. We went and saw this home couple of weeks ago and it is beyond repair, the roof and exterior walls have very large holes and the water just pours thru the house. It was probably a beautiful home in its day, such a shame it will probably end up just falling down. There is no such thing as a home beyond repair. A person with the time, energy, skills, and some money can do wonders. I see a LOT about this beauty which indicates that it would be worth the effort. Roofs can be fixed, missing plaster replaced, and rot eradicated. The front porch of this house is one of the best I have ever seen. Indeed, the entire facade is charm personified. 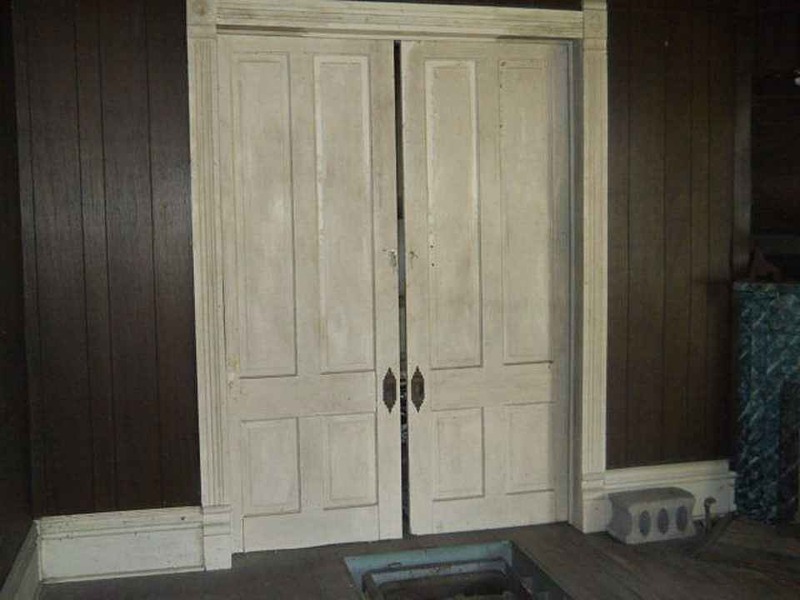 I also see lovely interior details, trim, and doors. Last year I looked at a big old home in terrible condition. Terrible! While the owner was showing me around, he suddenly asked: “Ross? You DO see all this, right?” He waved his hand around at the terrifying damage to the walls and ceiling in the dining room, all caused by roof leaks. And every room looked about the same. Some were much worse. I smiled, and assured him that I did see all the damage. But as it was all fixable, it did not really matter to me. What DID matter was the extraordinary beauty of the house. 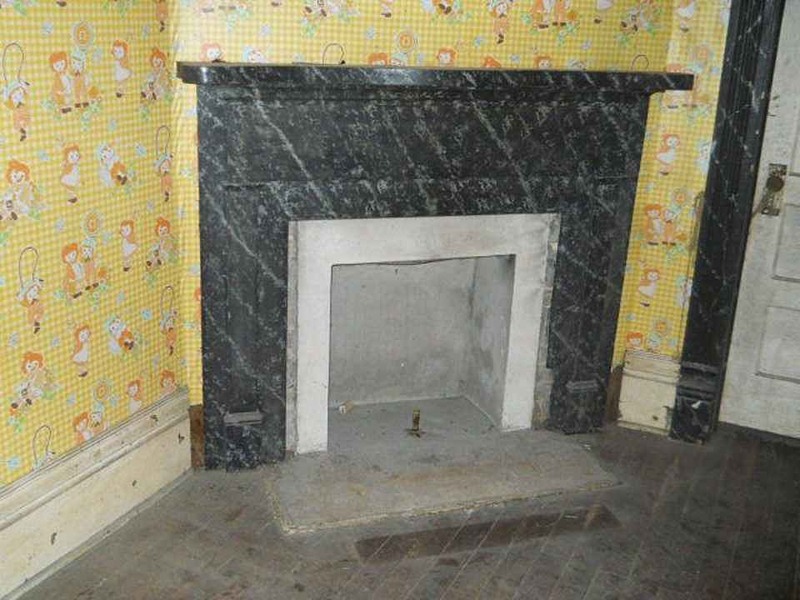 What also mattered was that all eight mantles (and the over-mantles) were still in place, as were all the 40 stained-glass windows, plus all the original doors/trim/hardware. The incredible front porch was mostly intact, and what was missing could be accurately recreated. The foundation was solid. Well, all THIS is what really mattered to me. And the price, luckily, reflected the ISSUES rather than the BEAUTY. So I purchased the big old house. having rehabilitated old homes, i must say that this one is NOT beyond repair..WE’ve tackled caved in roofs, falling walls, termites, joists, and the list goes on..like somebody said above, spending 100K on rehabbing an 8k house is a bargain..WEve spent more than that on smaller places and were pleased with results and the homes are now sold and happily occupied! NEVER say NEVER! it could be repaired but it would never yield a profit if resold, due to the average price per sq ft in this area, we saw it today, it was so sad to see its ruination, but some of its parts could be salvaged. Good luck it is beyond repair! We have restored several and there was no way we would have tackled this beast. It is rotten to the core and is about ready to fall in on itself. If they get a strong wind in McComb it will be gone. 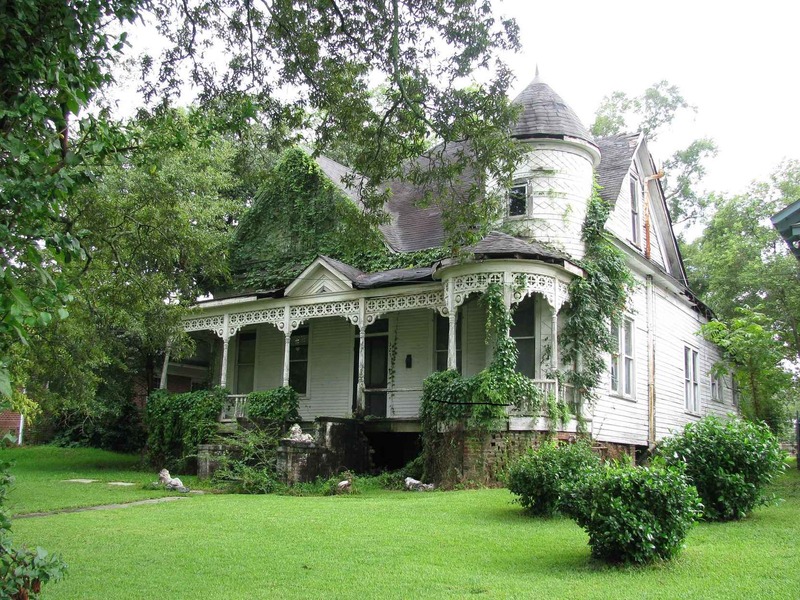 If I lived anywhere near Mississippi I would definitely buy this house and restore it. I agree with Ross (who is the most positive person ever) that with the money and the resources, nothing is beyond repair. This house could be fantastic again, but someone better save it soon or I’m afraid it will fall in. I would love to come back home to Miss. And save this great house. Just wish I had the money to buy it. 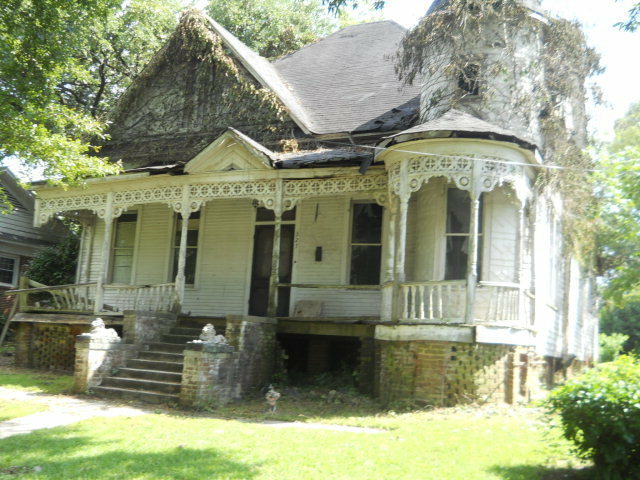 I wish I had the money, knowledge & talent necessary to renovate this beautiful home! Unfortunately, I have none of the above. The $8,000 purchase price is just a very small drop in the bucket. I spent my toddler years in this house in the 70’s. This breaks my heart. Oh! How amazing this must have been for you! Is that Raggedy Ann and Andy wallpaper? I am trying to convince my hubby to look at this beautiful home. Watching the show Fixer Upper makes me think tackle this! Lol! I have been daydreaming about this one. Truly I have visions of tea parties with my 3 children. Like I said previously this house is really bad. The realtor did not show how bad this is in his pictures. Yes anything is fixable with the right amount of money thrown at it, but to invest that kind of money in that house would be nuts in our opinion. It could be described as being held together by termites holding hands. The back part of the home is completely burnt out the floors exist in spots, the roof is barely there. It is ashame it has been left so long in the condition it is, this house was probably gorgeous at one time. I have no issue with your stating that the house is too much work for you. But your comments come across like NO ONE should even bother, because you would not. Geez, this seems unfair to the house. Every person who looks at this house will have a different reaction. Some will think: EEK! And they will run. Some will think: Cool! This place SO needs to be saved!!!!!! Whoee!!!!!! WHOEE!!!!!! I would care less if the back is fire-damaged. I could rebuild it. What matters to me is that GORGEOUS, INCREDIBLE, INTOXICATING front. A front dreams are made of. You talk about the house as if it was ONLY damage. But there be some dazzling stuff there…too. And for but eight grand. I grew up in this house (see previous comment). Although it pains me to say it, this house is, indeed, beyond repair, save a whole-house rebuild that utilizes whatever is salvageable for parts. The cost would be prohibitive, as the most one could hope for at resale in this neighborhood is around $70,000. It is truly a shame that whoever currently owns the property has let it rot. It was a showplace in its’ day. The best that could realistically be hoped for at this point in time would be for someone to salvage all those wonderful architectural details that are still intact for use elsewhere. I cannot tell you how many houses I have known which were deemed “beyond repair” but which have now been stunningly restored. I was wondering where the house is you mentioned above that you just bought with all the mantels and stained glass. Sounds beautiful, but like a very large house. Ross, I don’t always agree with everything you write but here we are on the same page. 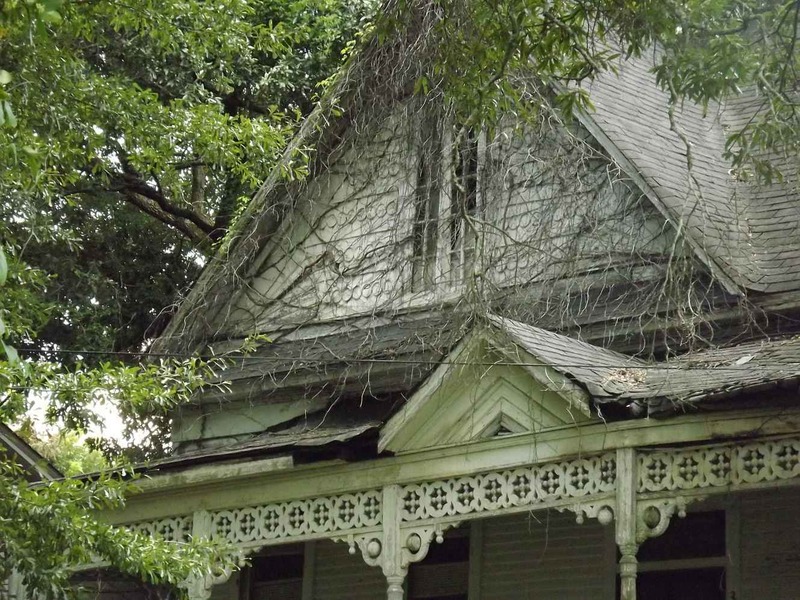 A badly neglected house like this to be saved needs the architectural equivalent of medical “triage”. The two critical issues for any old house are the roof and foundation. No restoration can move forward until both of these issues are resolved. I agree a lot of deconstruction or temporary support might have to occur and maybe much of the attic/roof framing replaced or reconstructed. 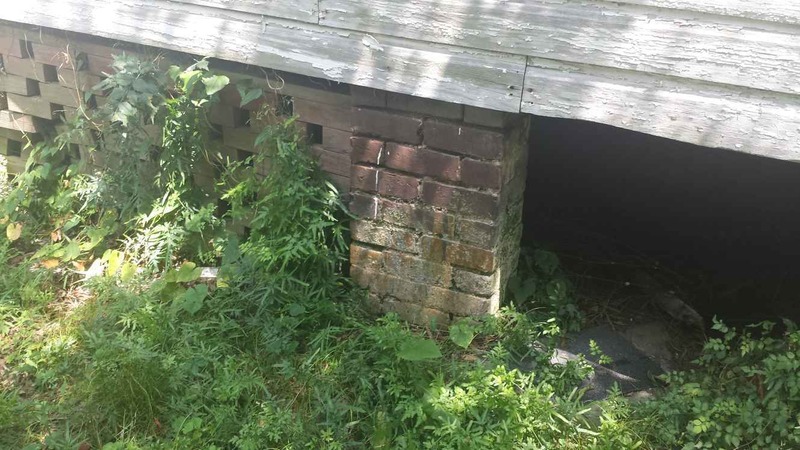 The brick piers do look pretty bad but here’s how you fix that: (before) https://www.flickr.com/photos/11236515@N05/1076980809/in/album-72157601360538293/ and after: https://www.flickr.com/photos/11236515@N05/1077841268/in/album-72157601360538293/ and I did these over a decade ago and the rebuilt piers are still solid as a rock. I replaced the original cracked soft bricks that used lime mortar with harder bricks I salvaged from a 1909 house and used a type N mortar mix. 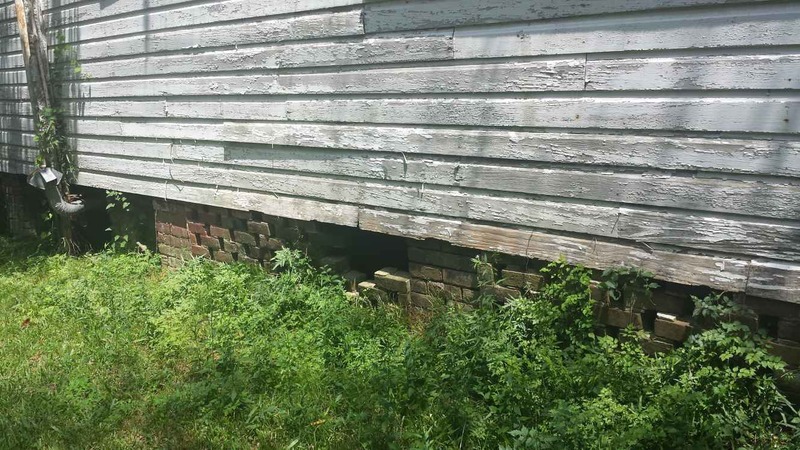 The basic approach to the foundation problem would be to find the highest point of the foundation (one could use a laser level) and then jack up the rest of the house to that level putting temporary block supports and then rebuilding the old piers. (or pouring modern concrete piers with construction tubes adding rebar and then facing them with bricks.) Once you have a new roof keeping things in the dry, and a level foundation, a room by room approach to the rest of the project will work fine. 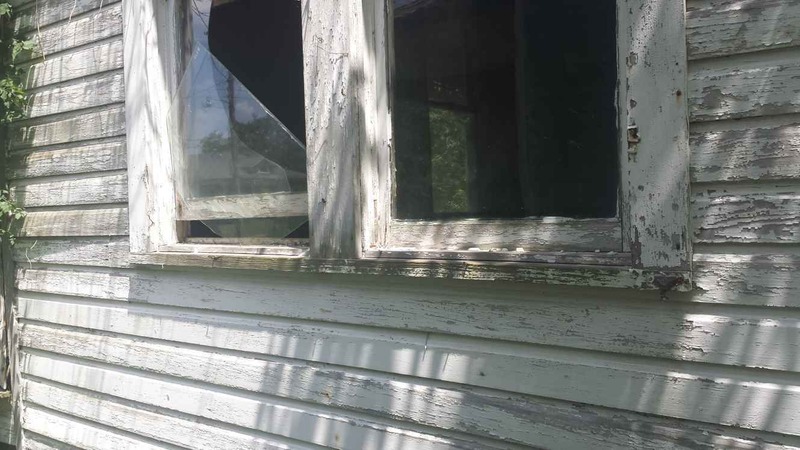 I commented on FB today under the post for this house that I’d be willing to offer free restoration advice via email to anyone who is willing to take on this project if they needed information. I certainly do not know it all but I do know where to find the answers for those things I do not know. In summary, everything is relative…I will concede that this is not a candidate for a house flip or a house with the expectation of a handsome return upon completion but it is a unique house with distinctive details and worthy of a labor of love reconstruction-restoration if someone is willing to do it. If I won the lottery or otherwise could afford to, I’d probably spend the rest of my life going around rescuing houses like this and, at best, would try to break even or minimize losses. The return for me would be another piece of our architectural heritage saved for the future. These are the most difficult types of homes to save because they need so much. Otherwise, if no one is willing, then someone please save the entire porch with the decorative details and whatever is worth saving inside. Fully restored in period colors, this modest but highly ornamental house would be a knockout. Think about the “before and “after” photos anyone willing to tackle this project would have to show. These kinds of daring rescues really have lots of visual drama comparing the project’s beginning with the end result. 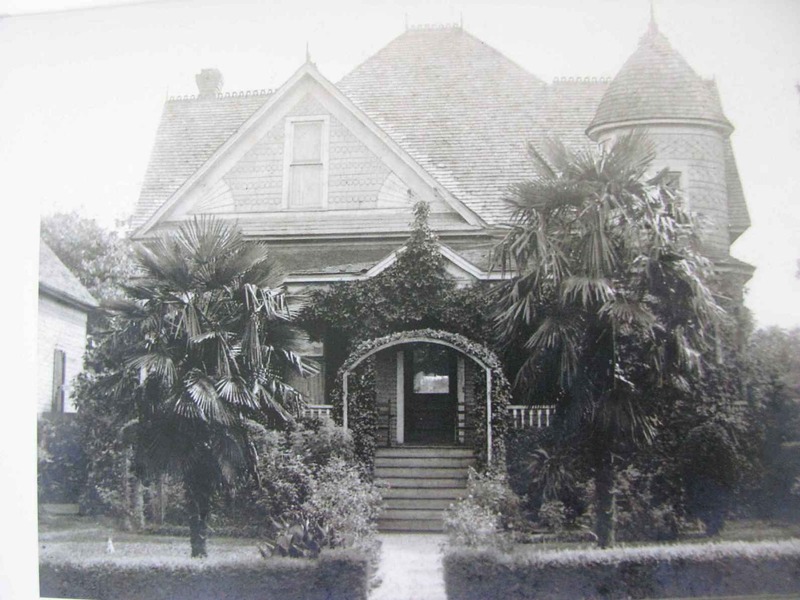 Speaking of “before and after ” photos, I have some 100+ year old photographs of this house in its’ heyday. I see nowhere to post them here. If anyone can enlighten me, or would like me to see them, please let me know. Email them to me, kelly@oldhousedreams.com and I will include them for all to see! Thanks! I am breathless with anticipation!!!!!!!!! Is the foundation safe enought to move the house thT hasnt been burnt to another state? Or is it concidered historical and has to remain there? Lisa, I think the house is “spoken for” see comments by Dora below. If not, yes it could be moved but to another state would require cutting it up into sections and taking it on flatbed trucks. Better if it would stay in McComb, IMO. Throwing in my two cents here…. Nothing is unrestorable, anything can be fixed with enough time and money. I cannot tell you how many times I have been involved with the purchase of a house declared a worthless disaster to find that with enough labor and enough love… That house comes roaring back to life. We’ve lifted houses and replaced foundations, removed and subsequently restored stucco to replace corner beams rotten to the core, handscraped and gently restored antique chestnut flooring riddled with termite damage, etc. It can all be fixed. 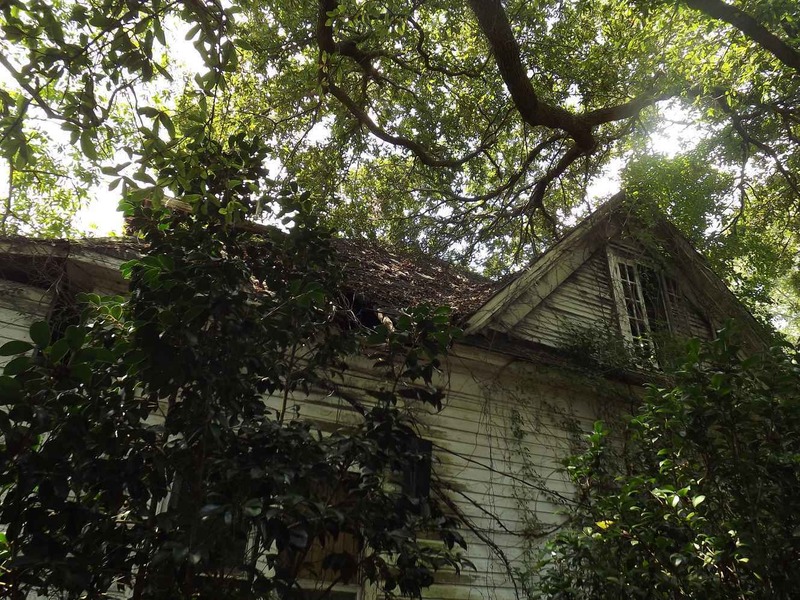 The only question that remains is can this house find an owner who loves it with enough passionate obsession that all of the years of dust and debris are worth it. I would suggest that if you look at a house and say “no it’s dead” this is not the house for you. But for that one hopeless romantic who walks in and says “YES”… It is never too late. It is simply time, money, and a passion for preservation for a particular house. Agreed! I need a like button for this comment. Well said, abaker. Where some see a house beyond help, others see a house waiting for someone to love it and bring it back. I have seen houses and structures brought back that even I would have to declare beyond saving for any rational person. 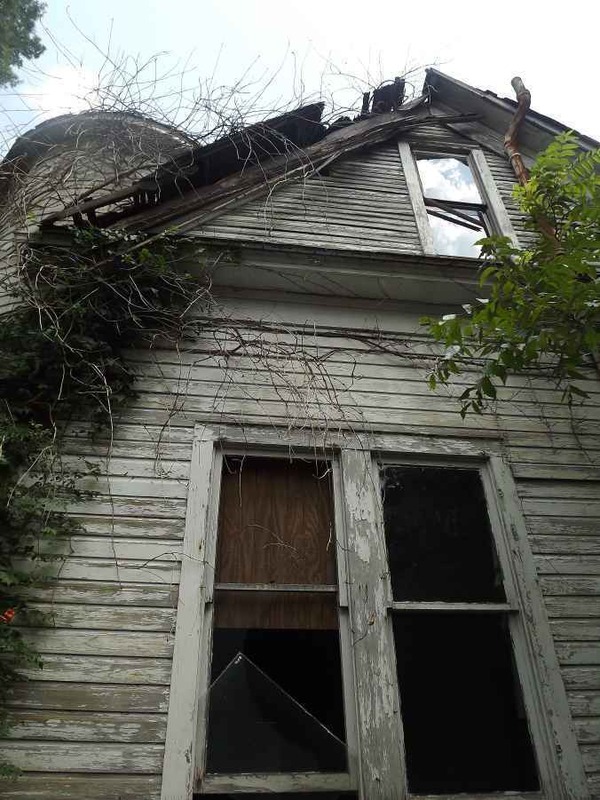 I hope this house finds that dedicated person and we get to see it post-restoration. 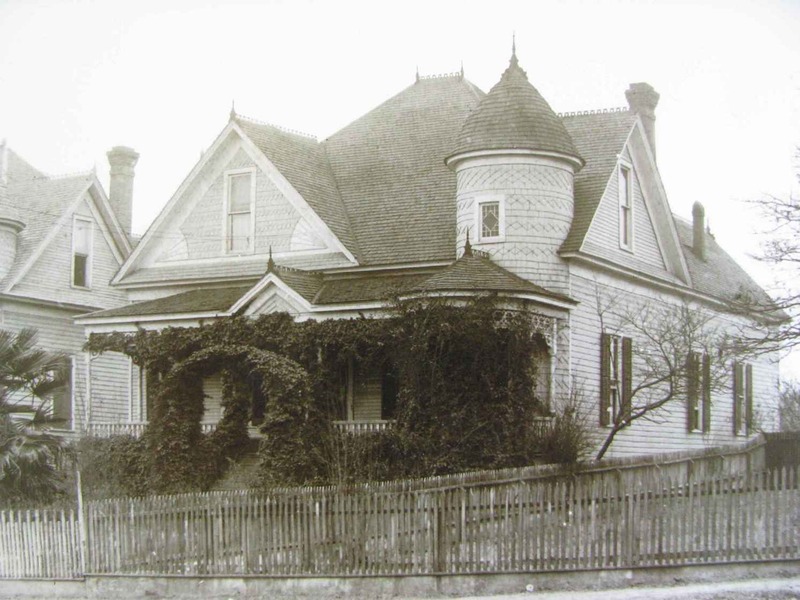 I’m also looking forward to seeing the period photos…I’m sure this house really stood out over a century ago. Thank you Linford for sending in the old photos and a better quality exterior (you can see the damage of the exterior a bit better, be sure to click on the photo he sent in to make it bigger!) He also said this in his email: By way of historical information, you will notice that there were originally two identical houses, side by side. They were built by spinster sisters, ca. the 1890s. The house on the left is in fact the one currently on your site. The house on the right (331 Missouri Ave.) was remodeled into a one story Craftsman style bungalow by my grandfather, ca. the mid 1920s. At $8,000, IF you have the money, you could put about $125,000 into the property and still be economically feasible. I see several comps in the neighborhood at $125,000 plus. Depending on the damage, I think that’s doable. I grew up in Mississippi. It’s a lot cheaper to get things done than in many parts of the country. Looks like a steal to me. Another “damsel-in distress” but at least someone is working on it and caring for it. McComb reminds me a lot of Grenada, MS where a recently passed away old house enthusiast bought a house posted on this blog before his illness took him away: http://www.oldhousedreams.com/2014/03/14/1898-grenada-ms/ We were privileged to see the Grenada house in person last Fall. I’m not sure about its current status. 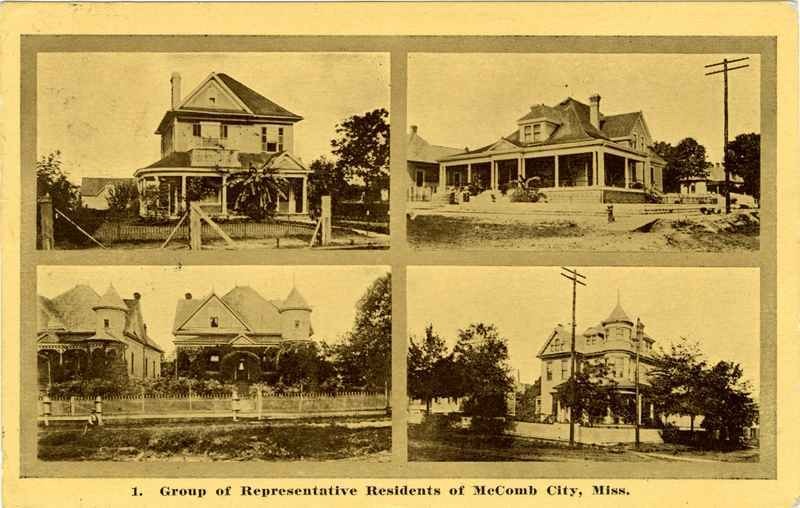 Looks like plenty of opportunities exist for old house restorers/enthusiasts in McComb. I hope both of these Queen Anne style houses are saved and restored. Thanks for sharing the link. Thanks Jim! ‘Tis a beauty, indeed. The house appears to be one of those pictured in the last image Linford sent in. Many thanks to Linford for sending in these photos! That first B & W photo is so clear it is a virtual image of an “after” restoration. Some contrast in color shades are noted which aids in determining color placement. That exact metal roof cresting pattern is still being made by the W.F. Norman corporation in tin or more expensive but durable copper. Same for the finials. Here’s a viewable and downloadable copy of their “Ornamental K” catalog: http://wfnorman.com/products/ornaments/ Both of these houses were very stylish for their time and sitting side-by-side must have been the showplaces of the neighborhood. That point is brought home in the “early residences” town photo which includes these two twin homes. Too bad these images weren’t available when this house first came to market but they will be of considerable value if anyone is willing to buy and save this once proud home. Again, many thanks to Linford. I sincerely hope this helps to trigger a positive response and increase potential buyer interest. Thank you so much for sharing the old photos!!! I hope an old house lover with enough money finds this house! No one takes on a house like this because they are going to make money by flipping it. 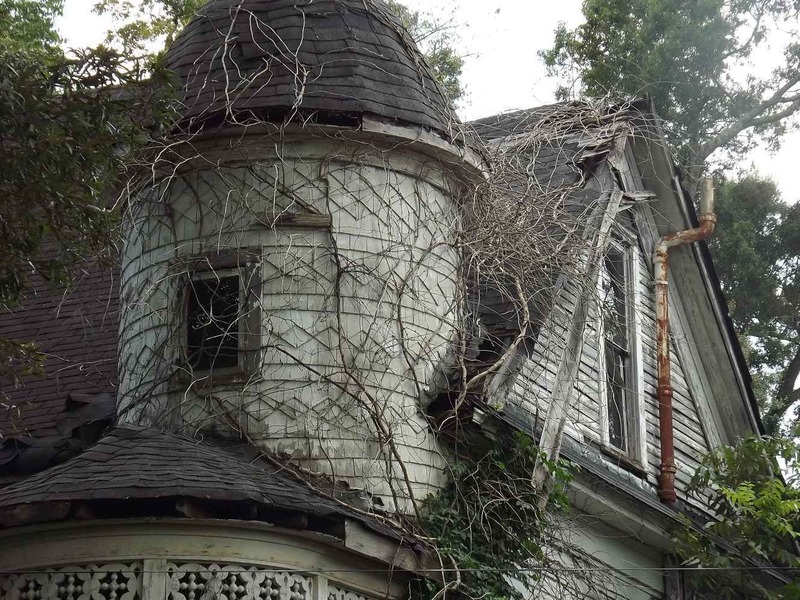 This house is a wedding cake beauty and it would be an act of love to restore it. Think of it with palm trees again and lovely gardens with a fountain. Personally, even of you put 150,000 into it how could you possibly duplicate this home for that in a new structure? You just couldn’t. It’s a beauty that deserves someone to love it again. If I was going to take it on I would also blog about it along the way for everyone that loves these old homes that so many think are no longer valuable. Susan… My sentiments exactly. I was ruminating on houses today as I was painting the hall in my own. These houses are a labor of love for their owners. I honestly don’t know if I’ve ever made a profit on a house that I’ve restored. I’ve tried to break even and I’ve left every house I’ve taken on with a chance (hopefully) at another century. To take on a project like this, you have to fall in love. I don’t know anyone who is reasonable or sane when in love. When my brother and I were kids we grew up across from a crumbling, turn of the century, behemoth. My brother adored this house. When the owner would leave for the summer.. He house sat and told everyone that he would someday live there and would bribe me to help him clean it from top to bottom while she was gone. 5 years ago… He bought it. 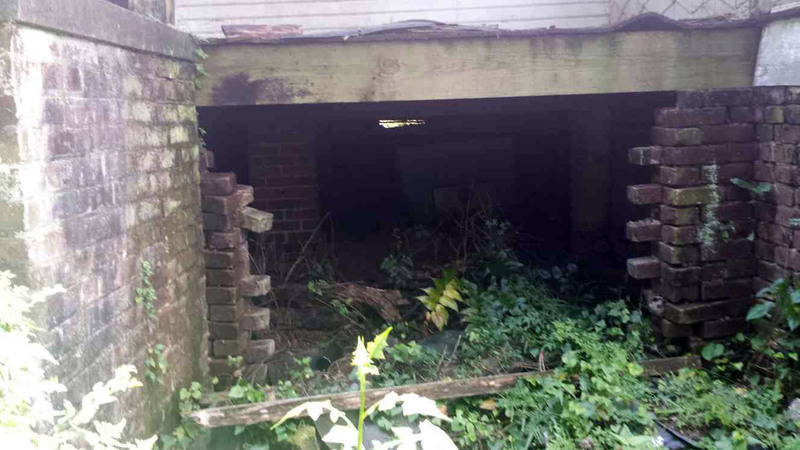 She’s a money pit for sure….. 65 years of serious neglect and crumbling stucco. But he is saving her… One enormous project at a time. Who knows what makes us crazies walk into these crumbling old houses but for the right person this could be the project of their dreams. Thank goodness for the crazies!!! Ross… I consider myself most blessed to be among them. I’ve learned more from my old houses than most people I know. Each one has been a journey, one that I will continue as long as I can hold a paint brush and climb a ladder. I’ll probably retire with less money than I could have. But I will be able to say that in my lifetime I have done things that bring me great joy. And I think that makes all the hard work worth it. Even as a little girl when my parents would drive though the crumbling waterfront of Portland Maine each summer I would stare at the buildings and think how wonderful they were. Of course now Portland waterfront is restored and beautiful but it took people to see through the decay. So that is what we do with our love for these beautiful old homes that need vision. We put life back into them. It is very rewarding, I agree. I also feel that way about the land around a neglected home. Bringing the land back to life is equally rewarding. I hope someone at least salvages all that beautiful gingerbread off the porch. A lot of woodwork could be saved if no one wants to take on the whole house. This sad, sweet old place really tugs at my heartstrings. 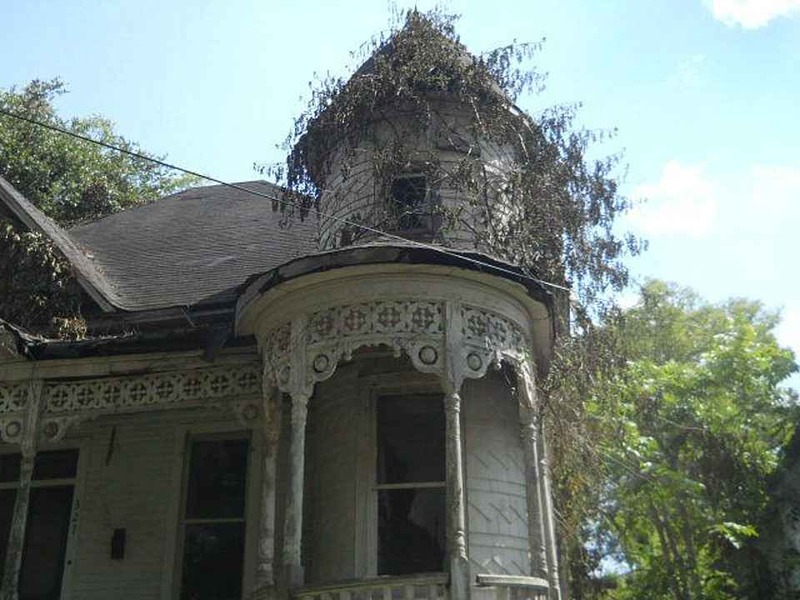 I don’t know anything about restoring old houses, except that I’d love to try it, even knowing I’d probably end up way over my head. Susan, as I previously mentioned, if you or anyone else has the courage to take on this project I’m willing to help with information. I’ve been working on old houses since the 1980’s and have completed projects in Texas, Missouri, and California. 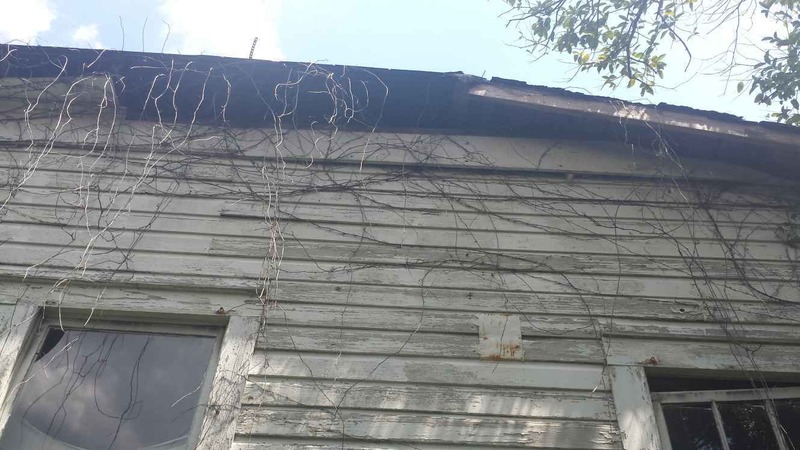 The basic approach to this one is: 1. cleanup…take out trash and debris (not the same as gutting the house which I don’t recommend) and cut away the vines; 2. evaluate all the needs: the roof and foundation come first in that order. Everything else follows. Figure a few thousand for the roof (if you do all or most of the work yourself) as it will need some structural re-framing based on information from those who have seen it. A few hundred for materials for foundation work…again, assuming you or someone working with or for you know what they are doing…(not a good DIY project for those with zero experience) You’ll need lots of heavy sound wood blocks (sound railroad ties can work) and house jacks rated at 10 tons or more; I prefer the old worm screw type but make sure the threads are sound if you use these kind as overloading them will cause the screw threads to shear off, crack and/or break. (old ones should be carefully inspected) Never use the sudden drop kind. Bowed foundation sills would have to be gradually (over a period of weeks or longer) pushed back up to level-trying to level them in one try will cause them to crack and break. No matter what type or method you use to level a house, safety always comes first, you don’t want a house to land on you like in the Wizard of Oz movie. I think at a minimum without seeing the full scope of the house’s condition you might need as much as $25k to make the house camp-able. Don’t forget to contact the city building department before you begin work, you may have to pull some permits and allow inspections. The price of the house may be cheap but bringing it back probably won’t be. That said, I still hope someone is willing to make the effort. Cindy, those restrictions generally apply to local historic districts which I do not believe this house is in one. 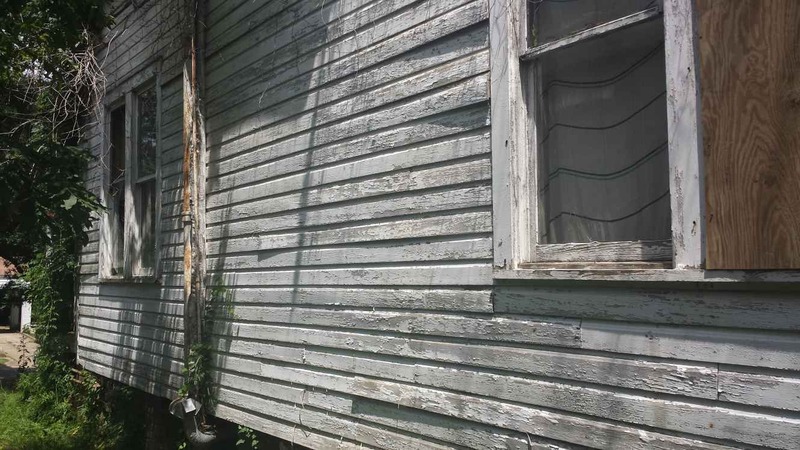 From a resale perspective, it’s better to have original type siding (synthetic Hardie planks look like original clapboards and last forever and would be acceptable) please keep (repair or rebuild) the original windows but outside of those items you pretty much have a carte blanche to do as you wish. As far as anyone telling you what not to do, that would b the city of McComb building department code standards department. (nothing to do with old houses just making sure all McComb homes meet minimum standards for safety and proper systems meeting city building code. Paint the house any color(s) you wish, green with pink polka dots is even permissable. Only in well established historic districts with strong neighborhood association overview and enforcement (like Savannah, Charleston, the Garden District in NOLA) are there restrictions of the kind you mention. 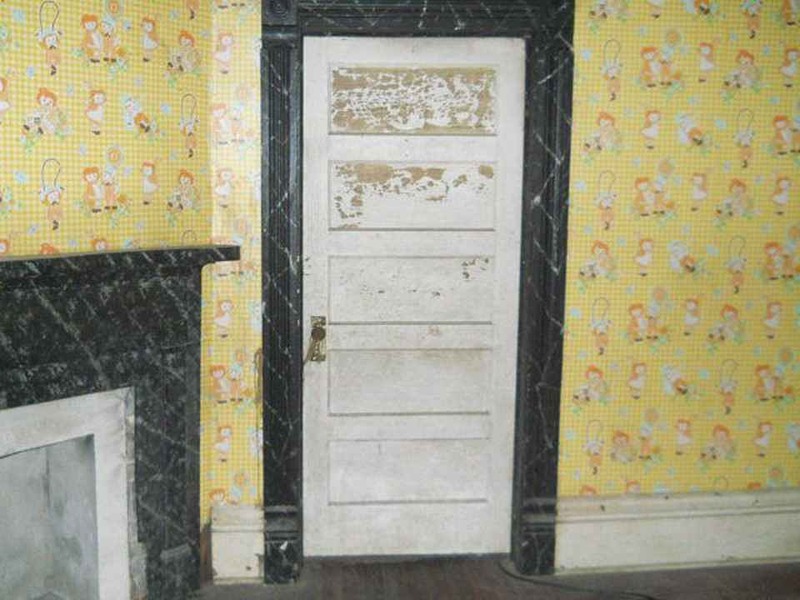 Addendum: In the “too far gone to save” category of restoration is the Stoddard House restoration in Silver City, Idaho. 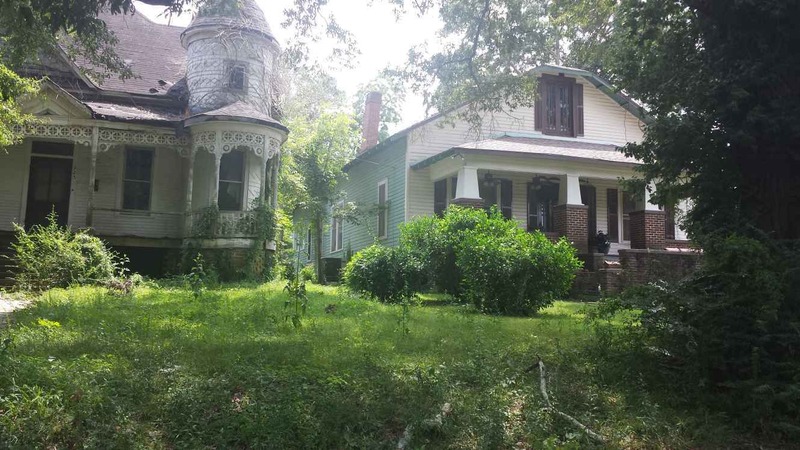 Someone posted a before and after image of this severely deteriorated house on FB and it almost makes this McComb house look like an easy project. Nothing is impossible if the necessary willpower and resources are available. Make sure you hold your mouse over the image to see the Before. I’m greatly saddened to learn of John C’s death, and will miss his comments and knowledge. He was a good man. Brave man, indeed. My wife and I had the privilege of meeting him in person in Grenada last November. He put up a courageous battle against cancer and survived two years beyond his doctor’s expectations. Perhaps that gave him some false hope because he went ahead and bought the Grenada, MS Victorian cottage knowing his vulnerabilities. He was lucid right up until his final days and will always be fondly remembered. I really don’t like the word’s rotten to the core. I am going to do my darndest to get this home! Restore it to it’s former glory. One step at a time. 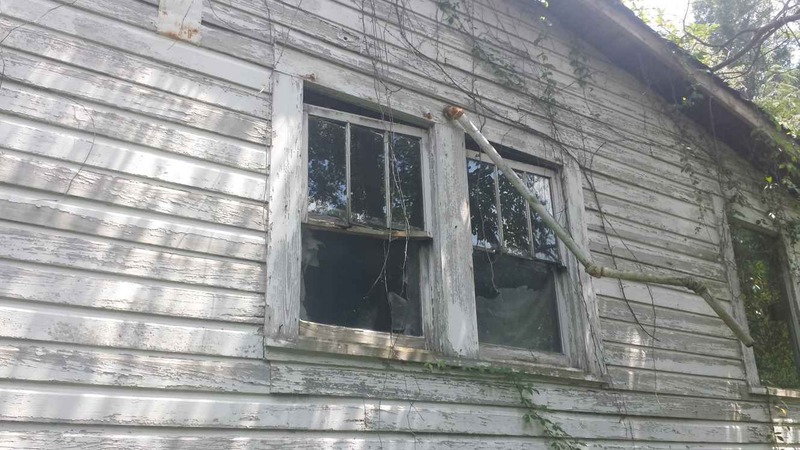 My daddy was a carpenter, my mama worked beside him, my family has a motto…nothing is impossible, with determination and being a south Mississippi woman, a red head to boot, I will restore this home. Then I’ll invite you naysayers over for a little party. I hope you will also invite the yessayers!!!! Please send hey day pictures to dgriffin1362@gmail.com. I am going to buy and restore this beautiful place and want it back to its glory. And most of all to the yes Sayers. Ney Sayers will be on porch looking in.? Admin note: Beth & Dora seem to be the same/related people/ladies/person. Yes, one and and same person! Dora, that’s the spirit! And with it you WILL succeed and save this house. You already have a fan club here waiting to cheer you on. 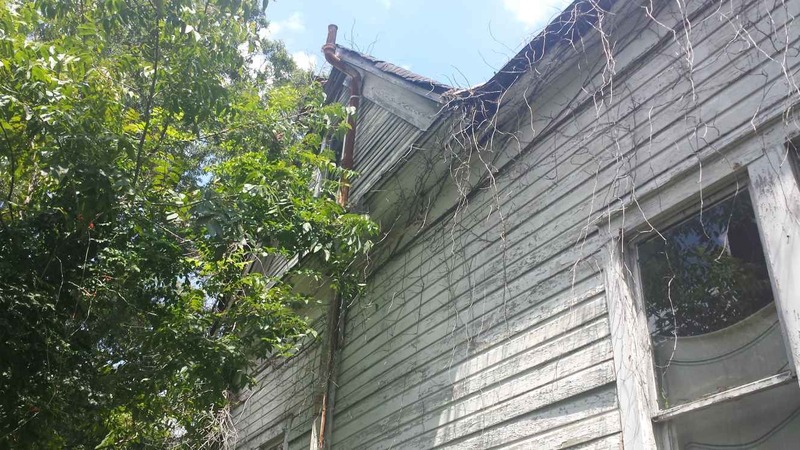 Since a project like this is a major milestone in a person’s life, I recommend keeping a record of your restoration journey because its something you’ll cherish for a lifetime and can help inspire others to meet the challenges of bringing back a badly deteriorated old house. 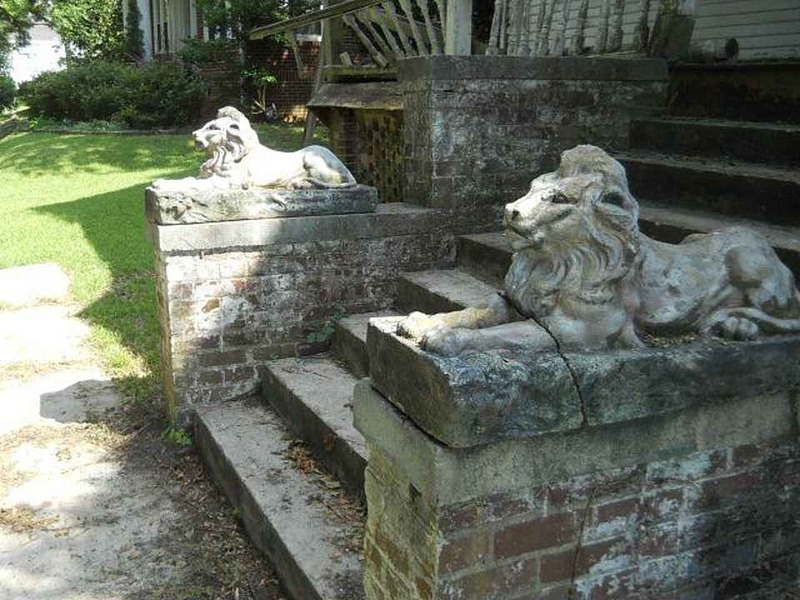 Historic Preservation is alive and well in the Magnolia State and there are a number of resources and fellow preservationist there. 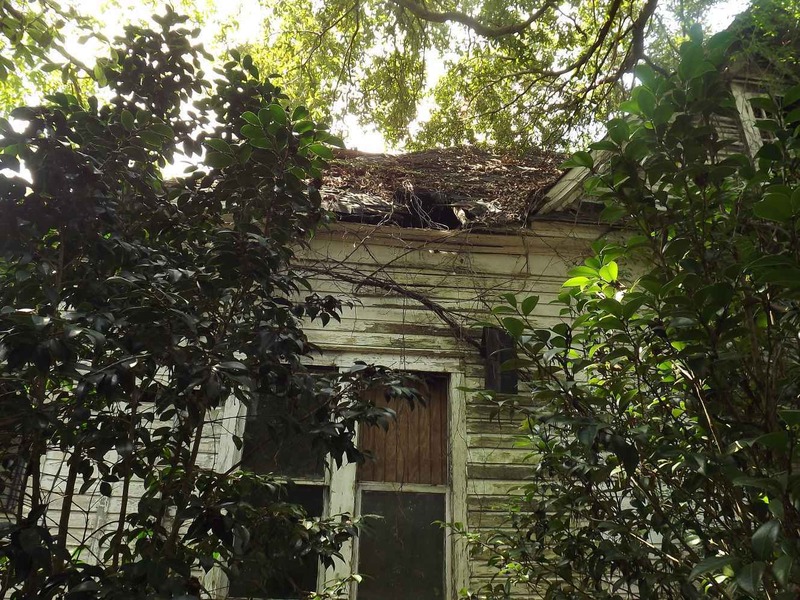 Here’s a blog/forum with a variety of Mississippi related preservation topics: http://misspreservation.com/ My late friend, John Clifford, a retired Chicago lawyer who bought a winter Victorian home in Grenada, used to frequently participate in an online Mississippi group and found valuable information there. I wish you the best if you decide to bring this once prominent home back from the brink. It’s good you have construction experience in your family because a house like this requires a lot of different talents and building trade knowledge. You go girl!!! You can do this! This beautiful place is worthy of someone just like you to care for it and bring it back to it’s former glory. Please blog it all. We want to see!!! 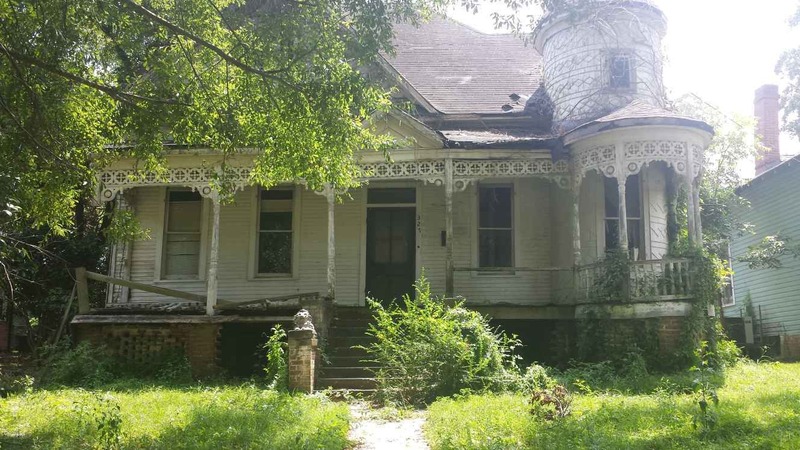 Maybe this makes me a naysayer, and I realize that I’m in the minority regarding the restoration of this once beautiful home, but I would caution to not let one’s emotions be the primary motivating factor in purchasing it. We’re all agreed that it will take plenty of time and money to restore, and I do hope Dora has the wherewithal to accomplish this. Regardless, it’s certainly not a project for the faint-of-heart. Greetings all. My husband and I went to visit this beautiful house today. I wanted to cry. Such a glorious gem she must have been. I’m saddened to say it is quite devastating what we saw. We took pictures and video if anyone would like to view. 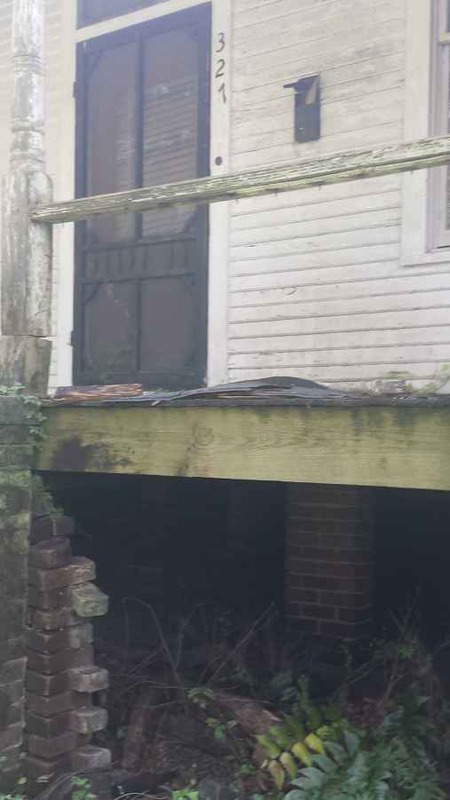 We planned to enter, but to walk on the porch would be considered unsafe at best. We have a passion for such historic and charm, but even living 3 hrs away, it would be at least a year project for us and simply too much of a commitment at this time in life. There is an empty lot across the street that would accommodate a duplicate with what salvageable pieces are without a doubt still there. These pieces alone seem worthy of the 8k. The intrigue was overwhelming. And the soul of this place is heartbroken. I can see the teenagers sneaking out of the upstairs windows…. croquet being played on the front lawn.. Christmas wreaths in the windows… and rockers and lemonade on the porch. What memories she has. Unfortunately I do not see great hope of anyone (considering how long she has sat in grim silence) rescuing her. And with the exception of a few neighboring houses, the street is pretty desolate. The hopeless romantic in me fantasies that she could restore life to all of them. With the most sincerity….. Janet (and Chris). Y’all, I have the time. I’m single, a solo truck driver the only thing I worry about is where I’m going to walk my dog. I stay on the road alot. Come in and bored having nothing to work on. I am going to do my darndest to do what can bring done. I’ve got time.I’m determined. Beth, I’d love for you to rescue this damsel in distress! Would also love seeing photos of the restoration process. 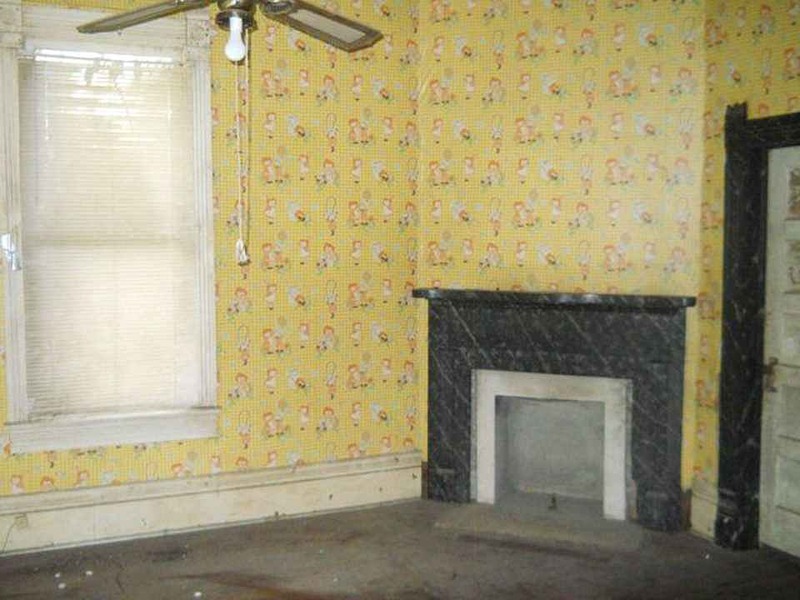 Even the Raggedy Ann wallpaper makes me smile. Beth, I admire your determination because that’s exactly what will be needed to see this house put back together again. Since its not livable and probably won’t be for a while, you might get an electric service utility pole set up behind the house, (for power tool use) park a small trailer or RV there(and can connect it to city sewer and water) and dwell on the site until its habitable. (unless you rent or already have a place to stay locally) A construction security fence around the perimeter will limit unauthorized access if you are on the road and have materials or fixtures stored on the premises. (you can also get a 20 foot shipping container with a heavy duty lock and store materials in there to avoid theft) I think you’ll be pleasantly surprised that once your project starts to show promise, some of your neighbors will start paying closer attention to their properties. This spin-off neighborhood improvement effect is common when a neglected property starts to come back and is one of the overlooked benefits of historic preservation. Good luck and please keep us posted on your progress. Pappy, I intend to do the best for this old lady. She deserves better. Hi “Pappy”, thanks for the introduction; nice to meet a fellow old house “character” with colorful stories like those you shared. As for overcoming obstacles, it’s often said when life knocks you down on your knees, you’re in a good position to begin praying. I salute your determination and glad that you’ve not let life’s challenges become insurmountable. Yes, John Clifford was truly an inspiration for everyone as he didn’t let a terminal cancer prognosis prevent him from following his old house dream. I assume by plasterer, you mean working with the traditional 3-coat plaster (scratch, brown, neat) over lath or metal lath using screeds and grounds for leveling? Not many practitioners of this almost lost art nowadays so if you’re among them, you have my admiration and respect. I take the easy route in making plaster repairs by patching in blue/green board. (I also use Larsen’s Plaster Weld and mesh bedding tape) Although I have a working knowledge about how a 3-coat plaster job is done, I would not attempt to do so myself. (folks, it’s not easy work, especially plastering a ceiling) I wish Dora the best if she takes on this project; besides grit and determination she may occasionally need some experienced advice if this is her first old house adventure although with her family construction background she’s probably better prepared than most to take this one on. I’m a bit older than you, Pappy, so my direct participation in old house restoration is gradually winding down and becoming more selective than in the past. (using the keyboard more these days than a hammer) Thanks for sharing your story and I wish you the best as you continue on your journey. Honestly, I’ve seen way worse brought back although it was about an 80%+ rebuild in that case. I hope someone doesn’t see this as a weekend project house. It needs serious muscle and know how or a person that can hire muscle and the serious know how. Not a flip, not a sell in a few years and make your money back kind of deal either. Just because you have $8k now doesn’t mean you should rush out and buy this because if you don’t have the money to immediately start on EVERYTHING then it will not be in any better position than it is now, you will only prolong it’s deterioration. I’m throwing this out to anyone considering it. If you have knowledge, REAL knowledge not armchair restoration/construction, feel free to discuss the needs of this home because it’s obvious from the pics what kind of damage is has. Well, I have lots of experience, and see nothing which cannot be fixed. 1) Is everything original, or close to it? 2) Are all the original bits still in situ? I mean, doors, windows, mantles, trim, etc. If the answer is yes to the above questions, then CONDITION is something I am not too worried about. Yes, it is nice if the condition is perfect, but that almost never happens. All old houses need work, and the lower the price the greater amount of work should be expected. And this house is almost free! I see a lot of roof and eave issues on the house. This is all fixable, but I agree with Kelly 100%: It needs serious muscle and serious know how, or a person who can hire serious muscle and serious know how. Great house. Fabulous house! It just depend what you see. The damage? Or the glory of the house? If you just see the former, RUN! If you see the latter, good for you, and caveat emptor! Oh come on ya’ll! I’ve seen TONS of houses on here that looked much worse than this one! For those who say that you could never turn a profit in this neighborhood? Well, mostly the people that love these houses are not TRYING to turn a profit. They’re buying the house because they are in love with it and and want to live in it. Not because they want to put their heart and soul into it and then let someone else run away with it and live THEIR lives in it! 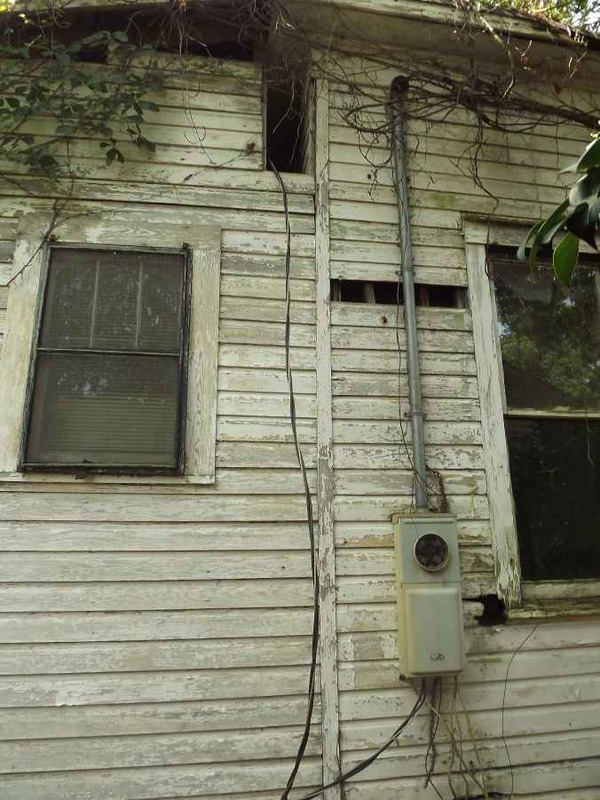 When people buy these houses and restore them, they are putting themSELVES into these homes. And you don’t put yourself into something to sell it off! And especially for profit! And so WHAT if it takes over a year, or over 2 years, or over 5 years? That’s not the point either. Buying these kinds of homes is a true labor of love. That phrase is used all the time, and cheaply when in comparison to what I’m talking about here. Ross is redoing Cross House as a labor of love. We don’t hear him complaining that it’s taking too long. He puts his heart and soul into that house. By the time he’s done, you truly won’t be able to separate them. He’s such a perfect example of what I’m talking about here. (You hear that Ross? You’re going to grow INTO your house! HAW HAW HAW HAW HAW!) OK, I’m done waxing poetic. But you have to realize. This is all totally subjective, and people look at these projects with totally different eyes. People who are serious about houses like this are NOT faint of heart! It is exactly like falling in love. You will see lots of them in all sorts of shapes and sizes. But when you see the one for YOU, that you will do ANYTHING for, nothing will be able to shake you! (And the $8,000 price tag doesn’t hurt a bit!) (i.e, She’s wonderful AND she’s cheap!) Dora, if this is your baby, GO for it! The love awaits! Are there any updates on the purchase of this home? My heart is pounding as I wish we could take on this house. We currently live in Baton Rouge, but I plan on at least driving to look at this one. It would take a miracle to convince my hubby to buy something like this, but I do believe in miracles. :) Did Dora get the house? Good luck. Folks from New Orleans and Alexandria have successfully rebuilt houses just a couple of blocks away. Note the painted lady and folk victorian on Edgar Street , across the street from The Dinner Bell restaurant. Looking at it again (thanks Linford!) and scrolling down the near 100 comments, obviously this house strikes a chord with its beautiful facade and extraordinary porch detail. There’s really no question that the house could be preserved, although it’s almost as clear that it wouldn’t be financially feasible unless a lot of work was done without pay. Whether it would be “worth it” to do it depends on the point of view. Beyond the wonderful porch and pretty facade, the structure is decrepit, and the interior is fairly routine without many fine details. I think it would be difficult to make this a great period house overall short of a heroic effort in time and money. I’d hate to see it lost though the investment required here might reasonably be better applied to a more complete and intact house. But the comments prove that love for these old places isn’t necessarily a rational thing. I would also like to add that a great many things in life, from falling in love, having children, writing a novel, planting a garden — and so many many many things — are not rational endeavors. And thank goodness! Thank goodness for the IRrational endeavor. Thank goodness! I would not wish to live in a world whereby only the rational was allowed. Long live the romantic, idealistic, hopeful endeavor!!!!!!!!!! Ross, please leave a little oxygen for opinions that differ from yours. I recently stumbled across this website and am in love! I’m just curious though. When some of these homes are offered at bargain prices, is the sale expected to be all cash? What I really want to know is how to fund a restoration that may cost upwards of a $100k as well as the purchase price. 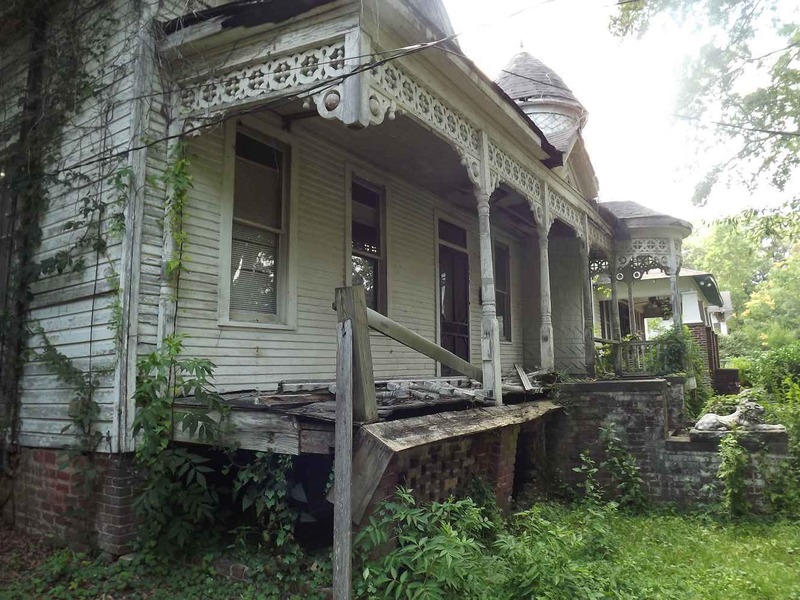 I’d love to take on an old home, but my funds for restoration could quickly dry-up. I’ve been reading, all of these wonderfully colorful, and informative comments and I’m right on the edge of my seat! I feel like I’m watching a fabulous old “Who Done It?”, and the anticipation is killing me. Then suddenly, just as I think I’m about to find out, “Who Done It”, …..the reel ends. Nothin’! You’re killin’ me, here! Did Dora buy the house? Will this beauty be restored to all her original glory? Will the little Queen Anne in McComb breathe new life???? What’s that Lassie? The trail went cold and now I have to wait for someone to write the next chapter? Noooooooooo! I just gotta know! I just gotta! Hey y’all!…give us a break! If anyone knows what happened with this house it will save me a trip. Or I could just go eat at the Dinner Bell restaurant and look for myself! Mama Rose, everything looked promising on this one then the line went dead. Given the small investment required to buy this house that needed almost everything, not a lot of money was involved. For some people, that means once they get the enormity of work needed to bring a house like this back, they have second thoughts or what is also called buyer’s remorse. I continue to hope that all the work had kept the new owner(s) busy and at some point they would come back with amazing photos of a glorious restoration. But when its all said and done, we just don’t know. I hope if you find out something you wouldn’t mind sharing it here. Thanks! Thanks John! I can understand buyers remorse. Been there done that. I wanted this house so bad but I know at my age and no experience it would have been a disaster. I hope to get a road trip going soon. When I find out something I will let the group know. Still a dream of mine that is hard to let go. The house is still standing, pretty much in the same condition, although it is now missing some windows that appear to have been removed. This will present a new avenue for the elements and wildlife to come and go. Hello everyone. I understand that this will disappoint some of the posters on this forum, but my wife and I have purchased this home with plans to deconstruct and salvage the material. As Linford commented previously, we have already started the process. For what its worth, our decision to tear this lovely home down was not a simple one, and it is our plan to salvage as much of the material as possible and to document the entire process. Smart move, we went to see it and although the pic shows a dreamy restore worthy structure, once you look into it, salvage is the best idea! 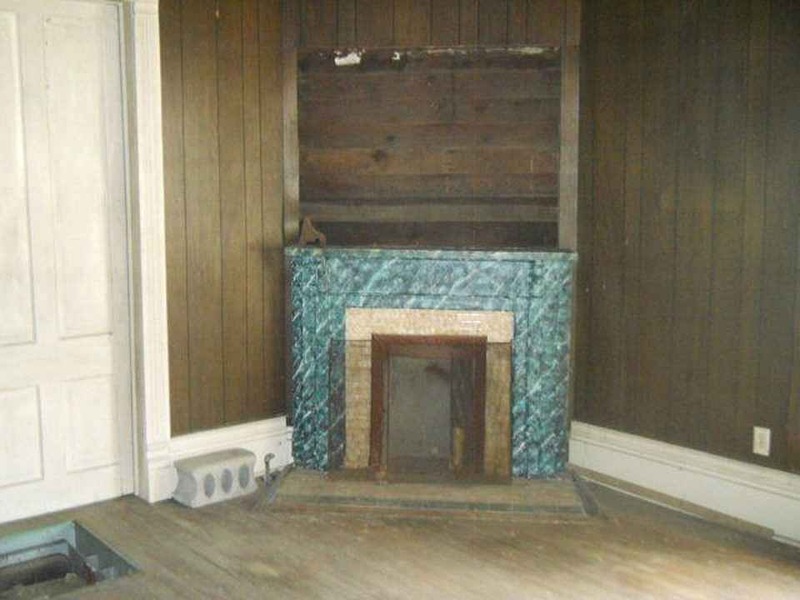 We recently bought an 1880 Victorian and would be interested in possibly purchasing some salvaged materials from this home. How can we contact you? 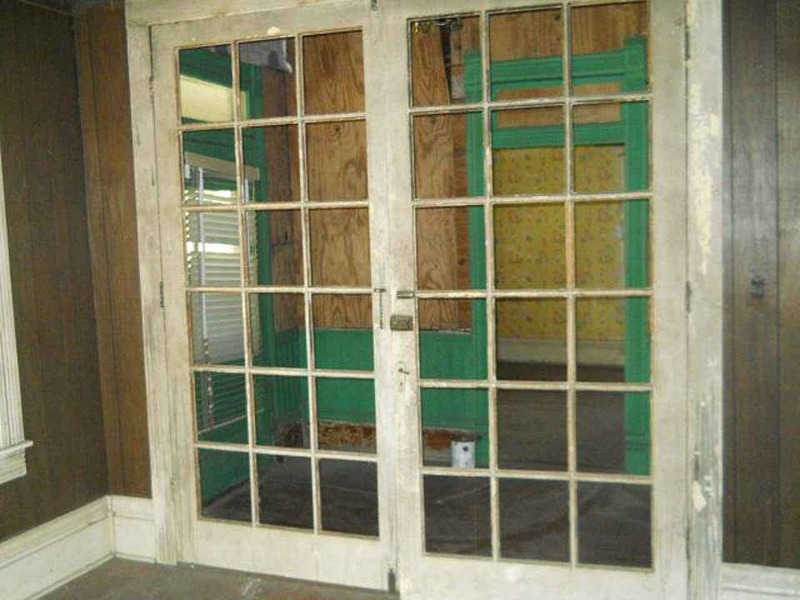 If it is still available, I would be interested in purchasing the original front door of the house. Please let me know if this is possible. Well at least parts of this lovely old house will live on elsewhere. Thanks to all who helped me get the answers I was searching for! Now on the lookout for a new beauty! Thanks for the information. I really believe that salvaging is the best possible route for this house at this time. Having grown up in the house, I may be interested in purchasing some materials. How may I get in touch with you? I wouldn’t mind purchasing a few things we saw in the house! I just stumbled upon this website in doing research about McComb. My father’s family lived there in the late 1800’s until the 1960’s. We were eating at the Dinner Bell in June of 2016, when I wandered over to this house that was just in ruins. I snapped a bunch of photos (I went inside) and wondering if there was any interest in seeing them. As in this home or another home in town?